We are really excited about our news at Flemings Mayfair and we want to share it with you. Have a look at our press articles that have been written about our Mayfair hotel and be sure to pop back to see the latest. "Best travel bargain around the globe"
"This quiet achieving Londoner impresses with style, substance and devilishly handsome good looks." "Paired with some of the best wine England has to offer"
"Food love poetry for your taste buds"
"Ormer's sophisticated, seasonally focused and achingly pretty fine dining." "There's nothing here that fails to delight." "Flemings is the absolute personification of charm and elegance." "Heute begrüßt das Londoner Hotel Gäste mit elegnater Opulenz." "Each guest room here received $100,000 worth of investments"
"Des diners intimes affiche la meme sophistication classique..."
"Best meal of 2016 in the UK? Well unless any late contender arrives now I would say a great big 'yes'!" "Ormer Mayfair is a true hit from the staff to the food to the atmosphere, we think we'll be back for more." "Ormer Mayfair's seasonally-changing menu is a delight"
"The elegantly designed chambers feature some very special hidden extras." 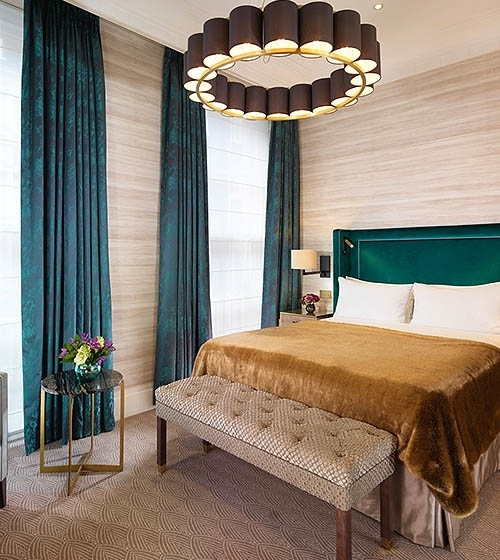 "A beautiful art deco-inspired interior and opulent touches"
"The hottest ticket in town"
"Excellent, room prices are fair for such a well equipped, now good looking, very central hotel"
Flemings MAyfair: Is this London's most sophisticated hotel? "Flying the flag for understated, quintessential British properties." "Ormer is a welcome addition to Mayfair's well-populated dining scene"
"The menu champions the same island produce that's made waves at the Jersey outpost." "Like a dream come true!" "Arguably London's most eagerly awaited restaurant run by celebrated chef Shaun Rankin." "Celebrating British heritage, the menu will bring together foraged herbs, English wine and seasonal produce." "The restaurant is part of a much wider modernisation for the Mayfair hotel, which is due to continue in 2017 so the hotel can fare well against its modern competitors." "We're delighted that diners are sharing our excitement about the upcoming launch of Ormer Mayfair." "Impeccable service in a relaxed environment and the freshest of ingredients from a Michelin-starred chef will provide the ultimate affordable luxury dining experience in the heart of London's Mayfair." "I was staying a hair's breadth from Piccadilly Circus." "Michelin-starred chef Shaun Rankin will open his new restaurant in Flemings Mayfair." "What a gorgeous jewel box of a Mayfair address." "Un joli secret: unterrasse fleurie"
"Jersey produce is to play a leading role." "Das Hotel legt viel Wert darauf eine kleine Portion extra Luxus anzubieten." "The Drawing Room is a stunning space that exudes elegance and grace." "Overall we had a wonderful visit, luxurious surroundings, delicious menu and ever so helpful staff - a must." "Flemings is the quintessential afternoon tea for the modern traditionalist." "This luxury boutique hotel is located in the heart of Mayfair"
"From the moment I walked in, I felt as though I was walking into a masterpiece." "You haven't seen luxe until you've seen Flemings Mayfair"
"Flemings Hotel is the epitome of an opulent London city break"
"2016 is shaping to be a great year for London"
"When the nights turn cold and dark, what better way to lift the spirits than with an afternoon tea?" "The chocoholic afternoon tea embraces the classic English tradition with a contemporary twist." "Forget cucumber sandwiches, The Drawing Room Chocolate Indulgence Afternoon Tea will delight any chocolate lover." "Luxury boutique hotel Flemings Mayfair has unveiled its first instalment of new-­look deluxe bedrooms and suites. These feature beautifully elegant interior design and some very special hidden extras as part of an expansive £14 million refurbishment." "Luxury boutique hotel Flemings Mayfair is investing £14 million in a refurbishment plan which will see the hotels 129 rooms, suites and apartments redesigned, as well as a new tea lounge, bar and new restaurant by Michelin chef Shaun Rankin installed in the hotel." "Luxury hotel Flemings in London's Mayfair has launched new lounge space the Drawing Room as part of its ongoing £14m refurbishment." "Boutique luxury hotel Flemings Mayfair has launched The Drawing Room, an elegant new space to act as the back drop to the venue’s afternoon tea service." "Flemings Mayfair has appointed Mateusz Przyborowski as the new Food & Beverage Service Manager." "Luxury boutique hotel, Flemings Mayfair has announced plans for an extensive £14m refurbishment, due to be completed in Q1 of 2016." "Work has already begun on the family-owned, leading SLH (Small Luxury Hotels of the World), which will see 129 bedrooms, suites and apartments renovated, alongside a tea lounge, bar and new restaurant by Michelin-starred chef Shaun Rankin." "Flemings Mayfair Hotel in London is to undergo a £14m refurbishment and open a new restaurant under chef Shaun Rankin. The new restaurant is due to open in March 2016 and will focus on Rankin's Jersey heritage." "Flemings Mayfair has appointed Henrik Muehle as the new General Manager of the privately owned boutique hotel in London. Founded in 1851, the 129-room luxury property is one of only a handful of family-owned hotels in the capital, as well as one of the oldest." "Seit 2014 wird es von dem gebürtigen Kölner Henrik Mühle geleitet." "He anticipates that lower cost of dining and entertainment will likely be a significant draw for tourists." "He is an invaluable addition thanks to his thorough understanding of the SLH brand and continuous cooperation." "It was wonderful to see such a strong response." "We are very excited about the changes at this historic hotel which dates back to 1851." Visit our blog, The Insider, to keep up to date out our latest news, offers and events.